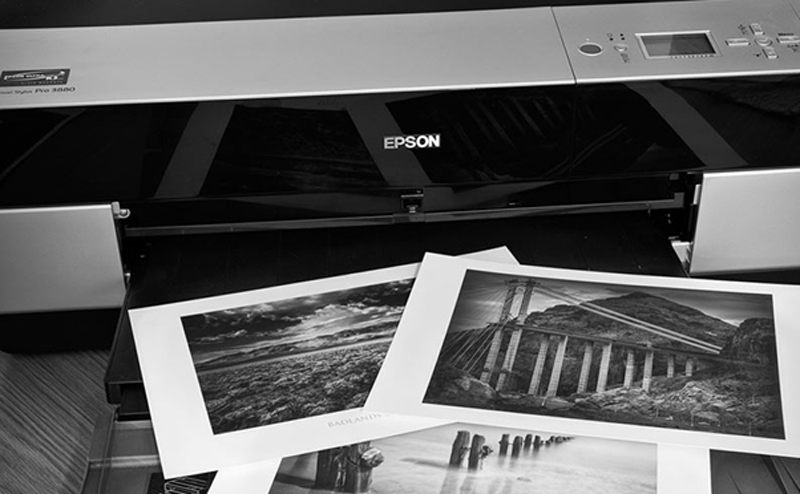 If you’re new to photography it’s a little difficult to know where to start when it comes to printing your work. You have to think about paper quality, weight, finish, size, the lot. And with so many options out there it can be tough to get it right first time. You’ve also got to think what is your work to be used for and where is it going? Naturally, many different options will have many different costs, so whether you’re printing for a business or purely for yourself, it’s worth costing up first. Most people will generally stick with Inkjet these days as the quality is much higher but laser will give you a speedier print and will be a little bit cheaper. The quality won’t be anywhere near that of Inkjet however, with the levels of print less accurate and therefore lessening the definition of an image. If you’re wanting high quality, which we’d think you are, Inkjet is most certainly the place to begin. The finish of the paper you buy is one of the most important things to consider when printing your photographs. There are a number of different types you can get, the most common being matt, glossy or satin. Matt: This will have no gloss to it at all and is one of the cheaper types to buy. You’ll regularly see it in brochures and mass-produced flyers for that very reason. There’s nothing wrong with that and if you’re printing in bulk it’s probably one of the more cost-effective papers. If you’re printing in black and white it’s a wise choice too as glossy can sometimes make an image look a little tacky and lack that bit of quality. Glossy: Glossy prints are the most common out there and the chemical coat helps protect the image as well helping the smaller details really stand out. Do be aware though, if you’re planning on showing the images in anywhere which might have glare, the shine off them could make them difficult to see. Satin: You’ll get a really nice finish on a satin image and sits halfway between a matt and gloss paper. It’s a happy medium and is a little more subtle than a glossy finish, making it a good option for black and white images. If you’re not sure on whether to go matt or glossy, satin is probably a safe bet for you. Budget will largely dictate this and it goes without saying the better quality papers will cost more. Your standard paper will have a cast coated receiving layer, which will produce less quality images than micro and nano pores receiving layers, used by professional photographers. These will produce the best results as the ink dries instantly producing the perfect image. It’s worth paying the extra money if you plan on showcasing your photographs. If they are for your own personal collection however, there’s no reason why you can’t use standard cast coated receiving layer paper. The same applies to paper weight. Paper is measured in GSM and the higher the GSM the weightier the paper will be. In some cases this can be really useful, for example if you’re displaying your work, but it’s not worth getting overly hung up on. It may not have any effect on the quality of image, unless you opted for really thin paper, but it will increase the images durability which can be important. It’s probably best to think of it like this. A brochure will get thrown away at the end of a season or set period. A portfolio of work will need to last a lifetime.